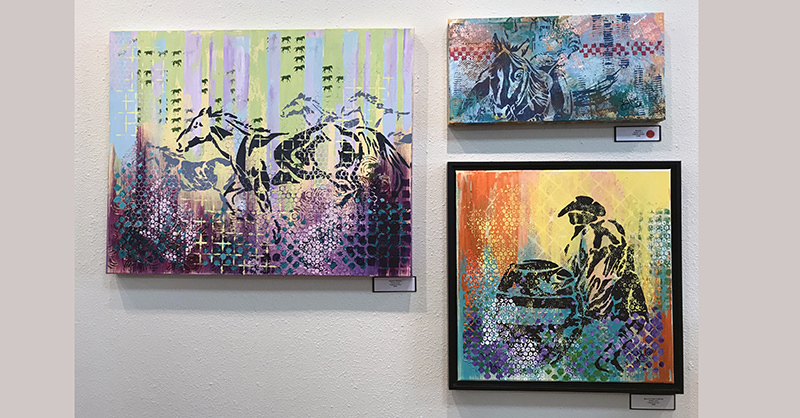 Susan Love’s bright colors and textures hit the canvas, changing traditional western scenes into contemporary paintings. Color pallets are inspired by the local environment. Paintings start with the warm yellow of dried grass covering the plains. Greens are inspired by the Ponderosa of South Dakota and Wyoming. The clear, bright colors of the skies show up in quantity. Acrylic and other mediums create texture when applied to canvas. She grew up on the Rosebud in South Dakota and has raised her family in Wyoming. It is no surprise that her art reflects traditional western scenes and classic rodeo shots. Susan paints full time and is committed to creating pieces that put you in the West, where all is good and often exciting. This entry was posted	on Tuesday, June 19th, 2018 at 11:19 am	and is filed under Art Gallery, Gallery Artists, News & Blog. You can follow any responses to this entry through the RSS 2.0 feed. Both comments and pings are currently closed.